It’s no secret that my main concern for the Annie Glidden North revitalization effort is the possibility that City of DeKalb and NIU are preparing to push a secret agenda to the detriment of public input and outcomes. “We have worked with a local realtor and contractor to identify a willing seller of a multiunit house in the neighborhood,” said David Castro, a member of the Ellwood House Neighborhood Group, a group of residents who have worked with the city in the past to restore the area. 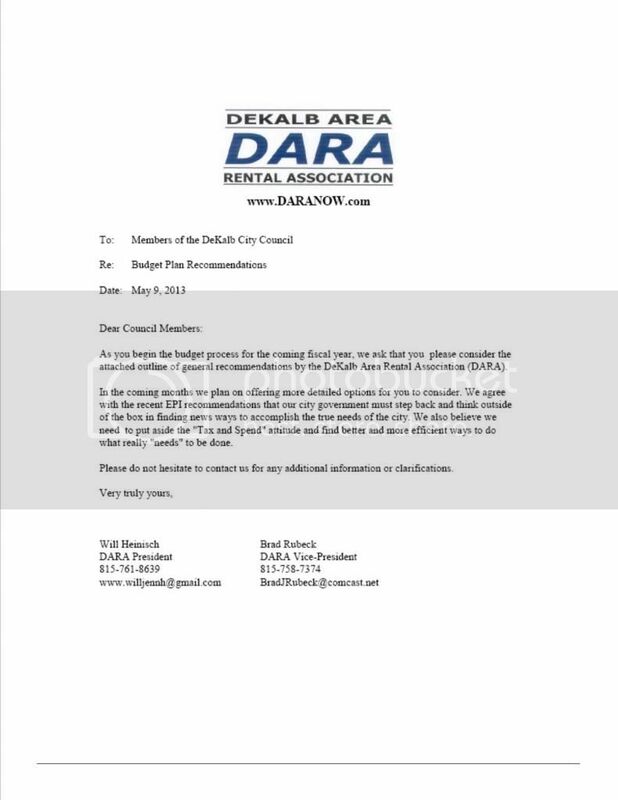 The DeKalb Area Rental Association (DARA) has sent city council members a letter and with general budget recommendations for FY2014. EPI, of course, refers to Executive Partners, Inc., their latest report to the city and the April workshop we talked about yesterday. It’s registration without tons of new staff or inspection ordinances of dubious constitutionality. Right now, the only thing between the city and a new landlord registry is the right software, said Paul Arena, president of the Rockford Apartment Association. The property managers want the database to link to the city’s police and code enforcement reporting tools so they can receive an e-mail when something happens at one of their properties. Arena said he’s confident that it can be done through a program that won’t put additional demands on city staff. Let’s compare in our signature DeKalb-centric way. The City of DeKalb put together what observers can now conclude was supposed to be a puppet task force to promote its rental inspection ambitions. The task force ended up not being a puppet, thereby forcing the administration to a) try an end run around its work by contracting with rental inspection “experts,” b) introduce (and re-introduce) and advocate its own ordinances at council though they ran counter to task force recommendations, and c) ensure victory by waiting until a key council member went on vacation to hold the final vote. The City of Rockford negotiated directly — and, it appears, sometimes fiercely — with its landlords, and will soon bring to its council an ordinance that has the support of both parties. Which city would you rather deal with? If you haven’t read about what transpired on Monday night, here’s the report from DeKalb County Online. And the first three minutes or so of the video below is a reminder of what single-minded pursuit of a goal can get you. The agenda for tomorrow’s city council meetings is here. Now, it finally becomes apparent* that the $6 million they’ve got stockpiled in the TIF 2 fund is mostly going to go into the Municipal Building. Of course, the use of TIF money for this purpose will bring in all kinds of new private development and tax revenues…somehow…right? Also up for consideration at first reading are changes to the housing ordinances (see PDF pp. 39-40. As previously discussed, the main problem with the proposals (besides the costs) is the blurring of police functions with code enforcement functions. Such disregard for roles and boundaries will come to no good and I’m quite surprised the police department seems willing to risk its reputation with a mess like this. DeKalb’s Committee of the Whole agenda for Monday includes a zombie ordinance. Enclosed is an old draft of an ordinance prepared by Klein Thorpe, and Jenkins in which property maintenance items were at one time included in a former draft of the Chronic Nuisance ordinance. The Housing Task Force rejected the ordinance, and Council already gave direction in this matter. Nevertheless, two council members (henceforth to be thought of as “Biernacki’s poodles” due to my having drawn personal conclusions) requested it be brought back onto the agenda. The DeKalb Area Rental Association (DARA) has responded by pointing out that the agenda addition brings building code into proposals that were meant only to address residents’ behaviors. What’s wrong with that? Potentially plenty. It means the zombie provisions are not tweaks, but rather constitute a proposal for a MAJOR POLICY SHIFT from code enforcement being a primarily a “civilian” activity to becoming a police function. There are a lot of implications — not the least of which is the elimination of Public Works jobs — and they deserve their own discussions on the merits. DeKalb city staff want to hire five people and buy four vehicles in their quest to a) ignore recommendations of the Safe/Quality Housing Task Force and b) implement the rental housing licensing and inspection program they’ve wanted all along. According to the agenda backup, start-up costs would come to $135,000 and the annual outlay would be $454,000. Fees would cover only about half of the ongoing annual costs — but wait! They’ve already budgeted $150,000 – $196,000 in contingencies over the next five years so it’s mostly taken care of and the rest can be “absorbed by other General Fund sources” so it’s all good! We know how really, really good DeKalb staff are at projecting revenues! But, at least the latest staff nonsense might mean council has signaled a decision against a tax increase for the program. Enjoy the latest performance of the “Cirque du DK” tonight in council chambers beginning 6 p.m. The Daily Chronicle lays out today the arguments for and against licensing and inspection of rental properties. There are four proposed laws before the council, but it’s the issue of licensing that has garnered the most attention and debate from aldermen, city officials, and landlords. City Manager Mark Biernacki has previously described it as being the linchpin of all the city’s efforts to improve the quality of its housing stock. [Local realtor and landlord Dan] McClure said he believes a licensing program could be abused by the government in the future. Although he does not mind firefighters coming through his various properties to inspect them, McClure disagrees with the notion that expanding inspections would help. Good point, Mr. McClure. 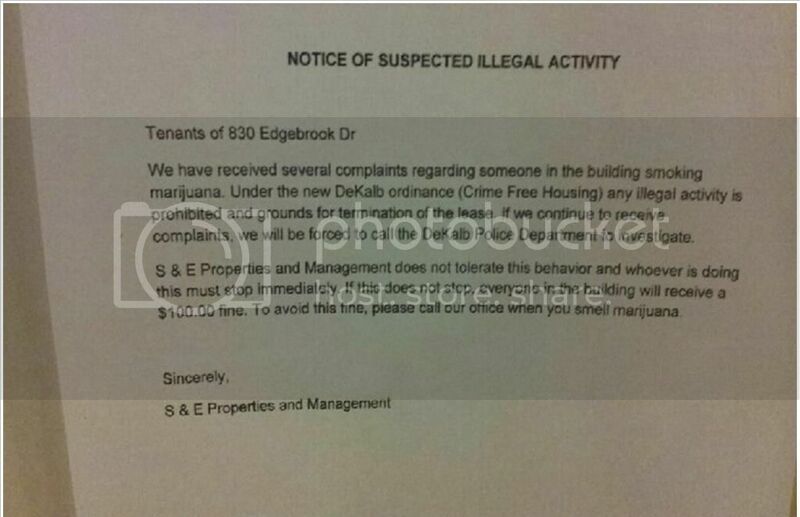 However, no interviews of tenants appeared in the article, so we’ll never know what they think. But let’s move on to asking why city staff want licensing and inspection so badly that they’ve hired people to manage a licensing programs that didn’t exist and to do an end run around its own Housing Task Force. You could argue that the main motivator is concern for tenants of very modest means and few options, but then I’d have to ask why none (save for a few students) were included as members of the Safe/Quality Housing Task Force. You might also suspect that the plan represents a new revenue stream, and you probably wouldn’t be wrong- wrong.